Our clients speak for this wonderful service! 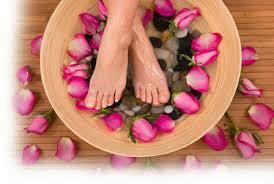 Foot soak and massage"My feet as well as my psyche thoroughly enjoyed the experience. A calm and soothing atmosphere and Lydia made this all come together with her expertise and gentle nature. Certainly a must for anyone." Hidden Gem for Wellness"Used a Groupon purchase to try J.O.Y. Wellness. Had a wonderfully soothing and refreshing one hour foot soak and massage and received much more. The tea and chocolates were a very welcome touch. This is a hidden gem where they seek to bring you total body, mind and spirit wellness without pressure or pretense. I will definitely be going back for the massage services as well as dipping my toes into the world of Yoga for the first time as a beginner. Spend an hour on yourself, you deserve it!" Great experience"My foot soak and massage was truly a great experience. Will definitely go back. I want to share this experience with my friends, so I am making my next appointment with friends." Wonderful"Lydia was caring, thoughtful and fantastic! She obviously loves what she does! I left feeling cared for and completely rejuvenated." Foot soak w/ massage"I took my mom for her birthday and Lydia was able to accommodate both of us at the same time so we could enjoy some relaxation and mother/daughter time. She did a lot to personalize the experience and make us very comfortable. Excellent service!" Foot Reflexology"Totally awesome experience. Thoroughly enjoyed my foot reflexology massage with Lydia. Lydia made me feel welcome and relaxed throughout the 1 hour experience. Tea, chocolates, warm neck towel, soothing music, and a citrus foot soak followed by a relaxing foot massage. What better way to end the day." Relaxing Tranquility!!! "My foot soak/massage was fabulous! Lydia was so sweet and kind! This was my first time visiting J.O.Y wellness, and it definitely won't be my last!!! Was beyond pleased with the whole experience!"